Quilts of Valor recipients, l.-r., Ray Prothman, George Christo and Ron Weltruski. The presentations to Ray Prothman, George Christo and Ron Weltruski were made during the 4-H Fashion Revue. Ray is a World War II veteran, while Ron and George are Vietnam veterans. 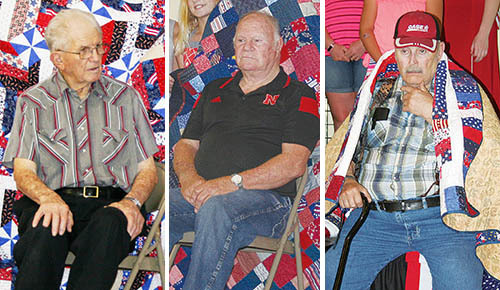 Nebraska 4-H is promoting the Quilts of Valor in its 4-H quilting program to honor veterans. Ray Prothman’s quilt was made by Arlene Neidhardt and her granddaughter, Olivia Connelly. Ron Weltruski’s quilt was made by Arlene Neidhardt, and George Christo’s quilt was made by 4-H members with training by Carol Kusek. Family members were present for the presentations. The Quilts of Valor Foundation was started in 2003. It is an effort to provide comfort, healing and hope to war veterans — a way to say thank you for their service, sacrifice and valor.